John Grochau of Portland's Grochau Cellars is the fastest winemaker in the Willamette Valley on a bicycle. You can write that down. Oddly, John and I once raced in the same race. Normally this wouldn't happen in bicycle racing because he's way faster than me. But the Rapha Gentleman's Race is unsanctioned. Ironically the race began in a vineyard in Forest Grove, Oregon and went for one hundred and twenty something miles. It was an exceedingly miserable day to race a bicycle that far, I mean it was sunny and all, but it was 102 degrees that day. I met John very briefly in the parking lot at Shaeffer Vineyards (their van/truck was parked next to ours) and never saw him again. His team passed ours somewhere on Pittsburgh Road. My team, Motofish Racing is the one mentioned in the paragraph below with one teammate who had 8 flats. The gravel of Pittsburgh road ate us alive and we never really recovered, but enjoyed the suffering, there's glory in it. 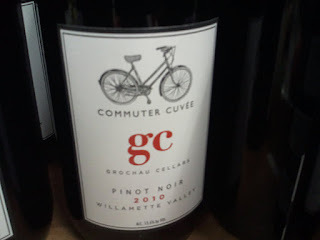 The 2010 Commuter Cuvee from Grochau Cellars is cool for a couple reasons, it has a bicycle on it, instead of a bird and it's a fruit forward Willamette Valley Pinot Noir in the $15 neighborhood. No suffering here folks. Bright red bramble berries across the nose with lots of raspberry aromatics. Like many of the Pinot Noirs that John's producing including some of the more expensive ones, (which are still very reasonable by Oregon Pinot standards) the fruit for this value priced Pinot is from identified vineyards from up and down the Valley. The aim of the Pinot Noir produced at Grochau is to be a suitable wine for food pairing and this bargain is no different. John shows this wine just a little barrel time and very little new oak, it's one of the first 2010 Pinots I saw out there. The resulting wine is a prime example of the "fresh fruit" signature of Willamette Valley. Bright red cherries, and those raspberries again appear on the palate as just the slightest hint of dusty spice announces the finish. A portion of the sale of these wines goes toward bicycle safety and awareness programs. Though there isn't a ton of this wine it's well distributed in both the Portland and Seattle markets.